In the previous 3-part series, Building a Microservices-based REST API with RestExpress, Java EE, and MongoDB, we developed a set of Java EE-based microservices, which formed the Virtual-Vehicles REST API. In Part One of this series, we introduced the concepts of a RESTful API and microservices, using the vehicle-themed Virtual-Vehicles REST API example. In Part Two, we gained a basic understanding of how RestExpress works to build microservices, and discovered how to get the microservices example up and running. Lastly, in Part Three, we explored how to use tools such as Postman, along with the API documentation, to test our microservices. For brevity, we will deploy the containers directly to the Jenkins CI Server, where they were built. In an upcoming post, I will demonstrate how to use the recently released Docker Machine to host the containers within an isolated VM. Note: All code for this post is available on GitHub, release version v1.0.0 on the ‘master’ branch (after running git clone …, run a ‘git checkout tags/v1.0.0’ command). In order to host the Virtual-Vehicles microservices, we must first compile the source code and produce build artifacts. In the case of the Virtual-Vehicles example, the build artifacts are a JAR file and at least one environment-specific properties file. In Part Two of our previous series, we compiled and produced JAR files for our microservices from the command line using Maven. To automatically build our Maven-based microservices project in this post, we will use Jenkins CI and the Jenkins Maven Project Plugin. 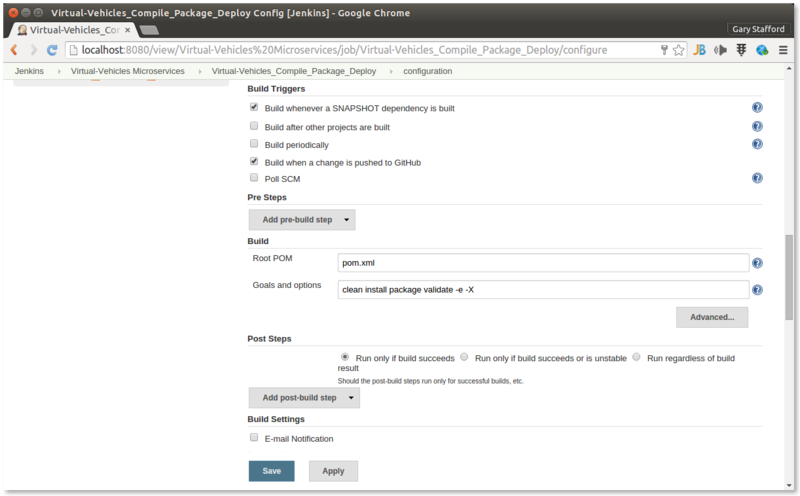 The Virtual-Vehicles microservices are bundled together into what Maven considers a multi-module project, which is defined by a parent POM referring to one or more sub-modules. Using the concept of project inheritance, Jenkins will compile each of the four microservices from the project’s single parent POM file. Note the four modules at the end of the pom.xml below, corresponding to each microservice. 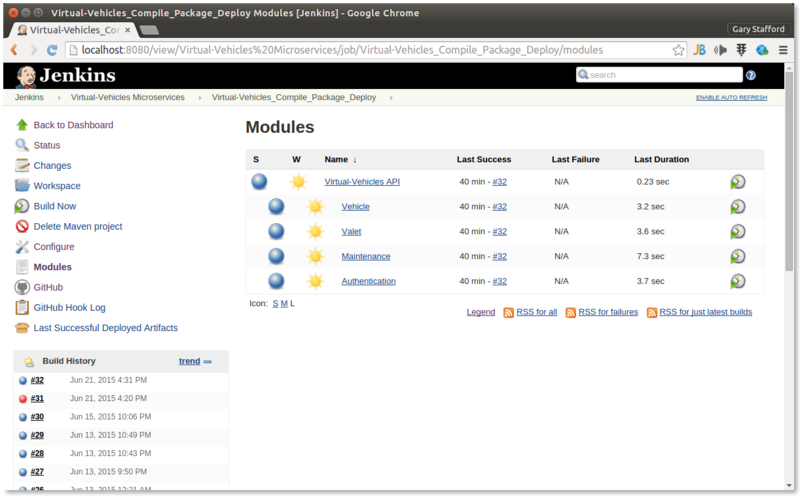 Below is the view of the four individual Maven modules, within the single Jenkins Maven job. Each microservice module contains a Maven POM files. The POM files use the Apache Maven Compiler Plugin to compile code, and the Apache Maven Shade Plugin to create ‘uber-jars’ from the compiled code. The Shade plugin provides the capability to package the artifact in an uber-jar, including its dependencies. This will allow us to independently host the service in its own container, without external dependencies. Lastly, using the Apache Maven Resources Plugin, Maven will copy the environment properties files from the source directory to the ‘target’ directory, which contains the JAR file. To accomplish these Maven tasks, all Jenkins needs to do is a series of Maven life-cycle goals: ‘clean install package validate‘. 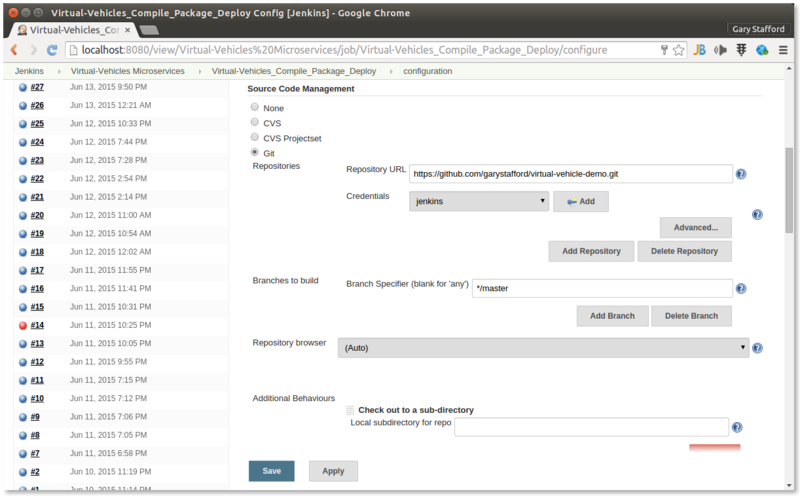 Once the code is compiled and packaged into uber-jars, Jenkins uses the Artifact Deployer Plugin to deploy the build artifacts from Jenkins’ workspace to a remote location. In our example, we will copy the artifacts to a second GitHub project, from which we will containerize our microservices. Shown below are the two Jenkins jobs. 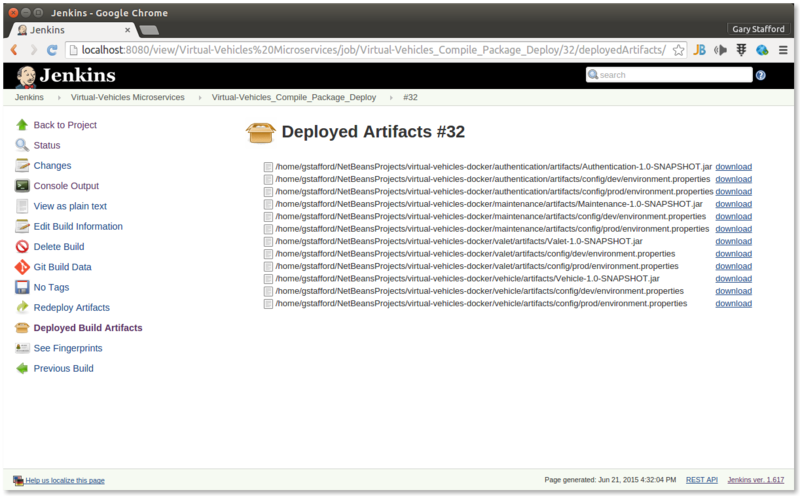 The first one compiles, packages, and deploys the build artifacts. The second job containerizes the services, databases, and monitoring application. Shown below are two screen grabs showing how we clone the Virtual-Vehicles GitHub repository and build the project using the main parent pom.xml file. Building the parent POM, in-turn builds all the microservice modules, using their POM files. 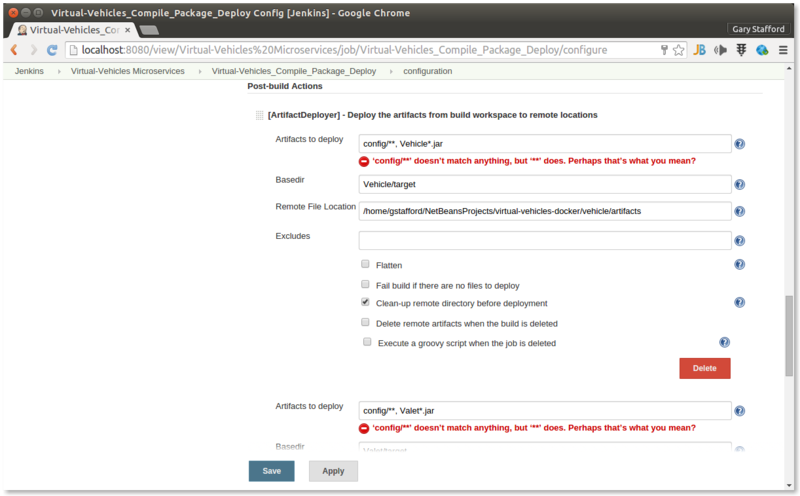 Once we have successfully compiled, tested (if we had unit tests with RestExpress), and packages the build artifacts as uber-jars, we deploy each set of build artifacts to a subfolder within the Virtual-Vehicles Docker GitHub project, using Jenkins’ Artifact Deployer Plugin. Shown below is the deployment configuration for just the Vehicles microservice. 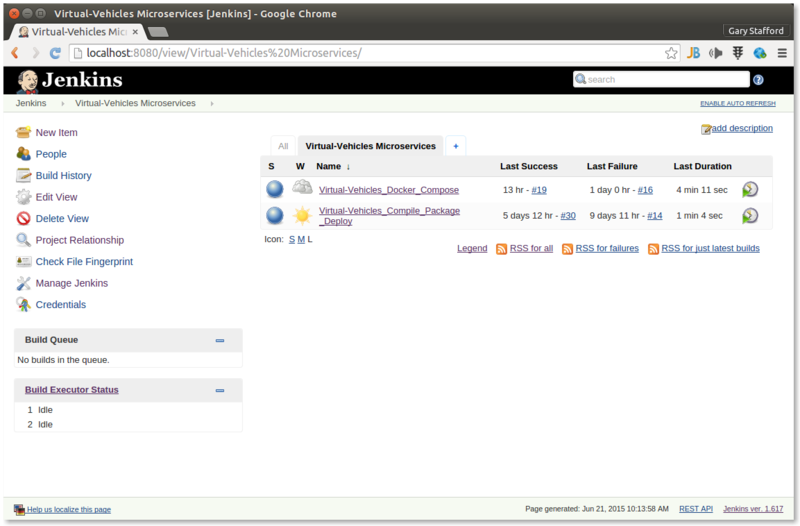 This deployment pattern is repeated for each service, within the Jenkins job configuration. The Jenkins’ Artifact Deployer Plugin also provides the convenient ability to view and to redeploy the artifacts. Below, you see a list of the microservice artifacts deployed to the Docker project by Jenkins. 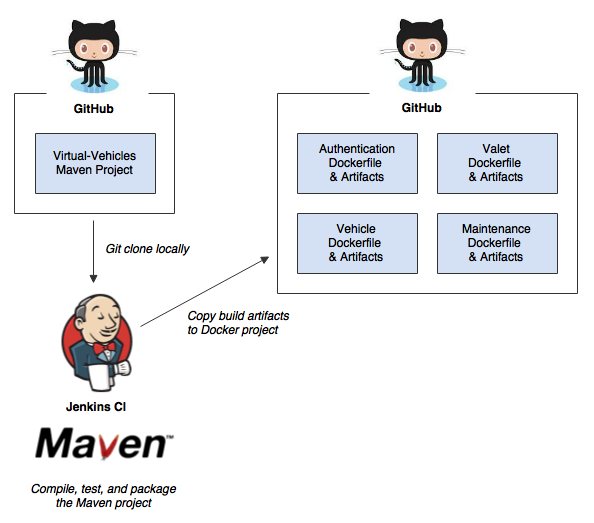 The second Jenkins job clones the Virtual-Vehicles Docker GitHub repository. The second Jenkins job executes commands from the shell prompt. The first commands use the Docker CLI to removes any existing images and containers, which might have been left over from previous job failures. 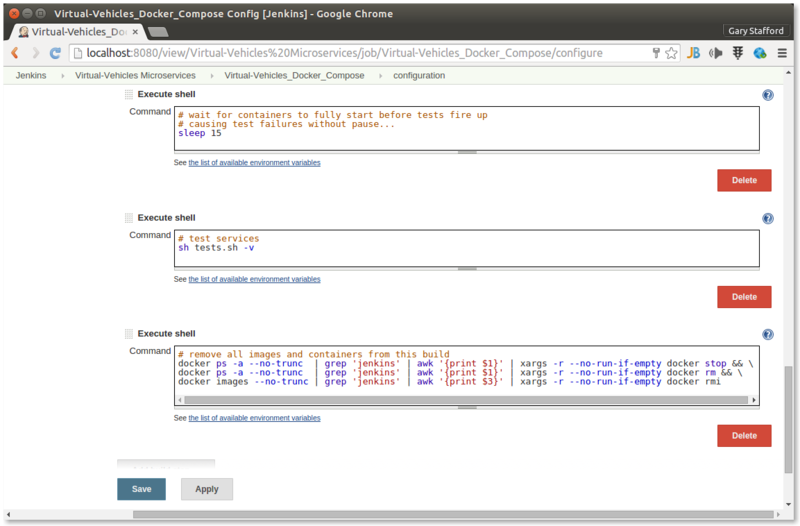 The second commands use the Docker Compose CLI to execute the project’s Docker Compose YAML file. The YAML file directs Docker Compose to pull and build the required Docker images, and to build and configure the Docker containers. Once the containers have been successfully built and configured, we run a series of integration tests to confirm the services are up and running. We refer to these tests as integration tests because they test the interaction of multiple components. Integration tests were covered in the last post, Building a Microservices-based REST API with RestExpress, Java EE, and MongoDB: Part 3. Note the short pause I have inserted before running the tests. Docker Compose does an excellent job of accounting for the required start-up order of the containers to avoid race conditions (see my previous post). However, depending on the speed of the host box, there is still a start-up period for the container’s processes to be up, running, and ready to receive traffic. Apache Log4j 2 and MongoDB startup, in particular, take extra time. I’ve seen the containers take as long as 1-2 minutes on a slow box to fully start. Without the pause, the tests fail with various errors, since the container’s processes are not all running. The bash-based tests below just scratch the surface as a complete set of integration tests. However, they demonstrate an effective multi-stage testing pattern for handling the complex nature of RESTful service request requirements. The tests build upon each other. 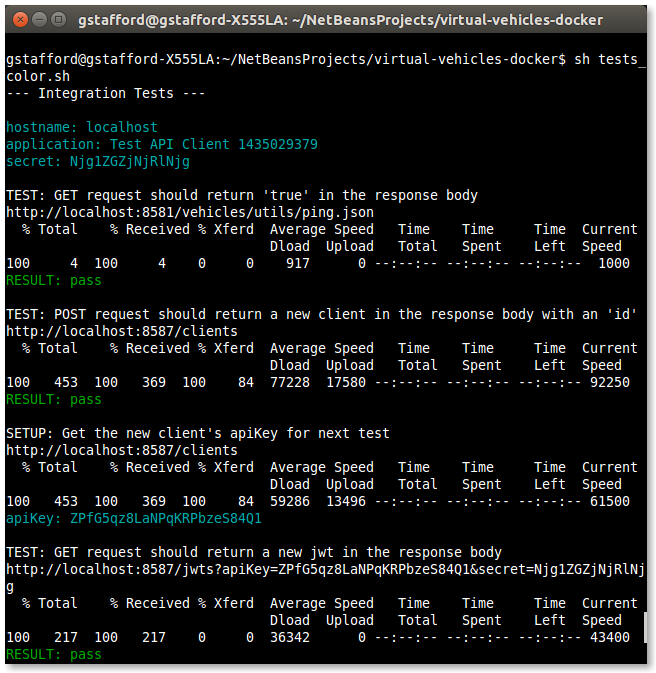 After setting up some variables, the tests register a new API client. Then, they use the new client’s API key to obtain a JWT. The tests then use the JWT to authenticate themselves, and create a new vehicle. Finally, they use the new vehicle’s id and the JWT to verify the existence for the new vehicle. Although some may consider using bash to test somewhat primitive, the script demonstrates the effectiveness of bash’s curl, grep, sed, awk, along with regular expressions, to test our RESTful services. echo "TEST: GET request should return 'true' in the response body"
echo "TEST: POST request should return a new client in the response body with an 'id'"
echo "SETUP: Get the new client's apiKey for next test"
echo "TEST: GET request should return a new jwt in the response body"
echo "SETUP: Get a new jwt using the new client for the next test"
echo "TEST: POST request should return a new vehicle in the response body with an 'id'"
echo "SETUP: Get id from new vehicle for the next test"
echo "TEST: GET request should return a vehicle in the response body with the requested 'id'"
Since our tests are just a bash script, they can also be ran separately from the command line, as in the screen grab below. The output, except for the colored text, is identical to what appears in the Jenkins console output. Once the integration tests have completed, we ‘tear down’ the project by removing the Virtual-Vehicle images and containers. We simply repeat the first commands we ran at the start of the Jenkins build phase. You could choose to remove the tear down step, and use this job as a way to simply build and start your multi-container application. The below diagram show the entire process, start to finish. This entry was posted on June 22, 2015, 9:11 pm and is filed under Bash Scripting, Build Automation, Continuous Delivery, DevOps, Enterprise Software Development. You can follow any responses to this entry through RSS 2.0. You can leave a response, or trackback from your own site. Great article, thanks a lot. 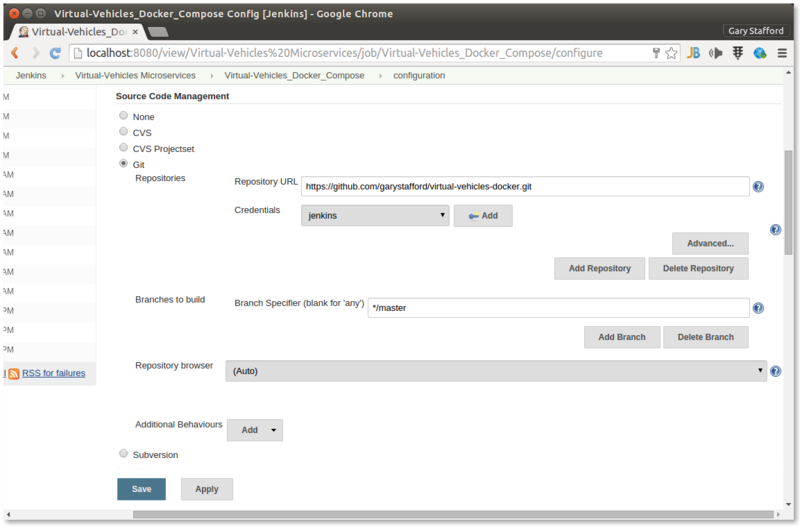 and I have a question, when and how replace the JAVA configure properties like the DB_URL when connect the two Docker containers. But… imagine your microservices are in the different repos, have been written by different teams, using different languages…. In that case, I would rather run integration test independently for each micro. Checking how does it work with DB, file system etc and mocking external microservices. Hence, each team will be able to write code, unit tests, and integration tests independently. You could use docker here for app, db etc. but I’m not sure you need docker compose. Hey Gary A, really a great tutorial. I’ve got a doubt because i am trying to run docker command in jenkins but it has been imposible to run the docker-compose and docker-machine from the shell of jenkits. do you have any tutorial or advice to try to run the jobs that you upload to the repository on Jenkits? What tool do you use for diagrams drawing? Hi GARY STAFFORD. Nice to read this article. I am trying to write a docker-compose.yml for Java, Maven and Jenkins. But unfortunately java and maven exist with code 0. Any idea why it’s behaving like that? Check the container logs for a cause? jdkSetup_1 | git is already the newest version. jdkSetup_1 | 0 upgraded, 0 newly installed, 0 to remove and 0 not upgraded. Your commands will run and the container will exit. It’s working correctly as coded, right? The containers executed you commands and exited. I wanted to run some maven based java code in this container and I am expecting all 3 container should up. Could you please help? Sure, then you would run a java jar command to start, just like you would locally. Containers execute the command you give it. If it’s a short live command, that’s as long as he container runs.